Life is a Musical Thing . . . Is This What Boys are Learning? 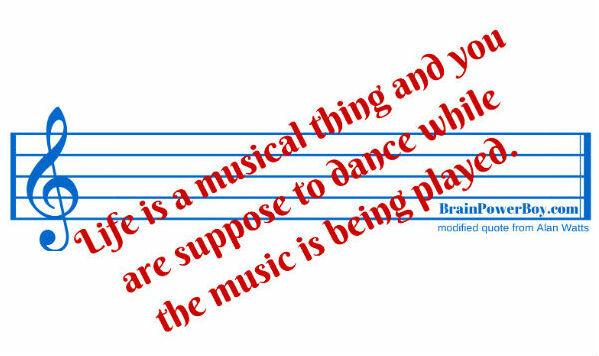 Life is a Musical Thing and You are Suppose to Dance While the Music is Being Played. Is This What Boys are Learning? This video, done as an overlay to narration by Allan Watts, is a good reminder that boys (and adults) need to pay attention to the path they are on and make sure they enjoy the journey along the way. I do not think it is too early to talk with young boys about life. In fact, I think it is rather important to do so. It doesn’t have to be a huge conversation with the big questions about what they are going to do when they grow up. It can be questions about what they enjoy doing, about what they think about during their quiet times, about what happiness means to them. For older boys you could have them watch the video and ask them to think about their path in life and if it is of their own making or if it is a predetermined path that they must go down in order to meet with success. Ask them what success means to them. I watched this video a couple of times because I liked the quote at the beginning and the message is one that we should all take in. Are our boys learning to enjoy the journey? That the end isn’t the big prize but that what you experience along the path you take matters? Unfortunately, no, not really. There are too many boys who go through the predetermined steps, follow the rules, and find that they are very unhappy later in life. Thanks to Wendy Priesnitz for posting the quote on FB and inspiring this post. Better for them to try to find some time to focus on their passions along the way. Better to make time to enjoy the small moments in life. The focus on academics is getting a bit out of hand but we have choices. We can follow along with the way experts think we should go, or perhaps, we can look further down the path and make our own choices so we can have a life that is meaningful to us. In the end it is not the degrees you end up with, or the number of toys you have that matter. Let’s make sure our boys are learning there is more than one way to do things, that paying attention to the tiny details of the journey leads to great joy, and that life is about so much more. Life is a musical thing. . . it’s nice to think about. Did you enjoy this video? Let me know what you think we can do to make sure that boys have time now and throughout their lives to have an enriching life and define their success while still thinking of being prepared for *their* future. Are these ideas mutually exclusive?